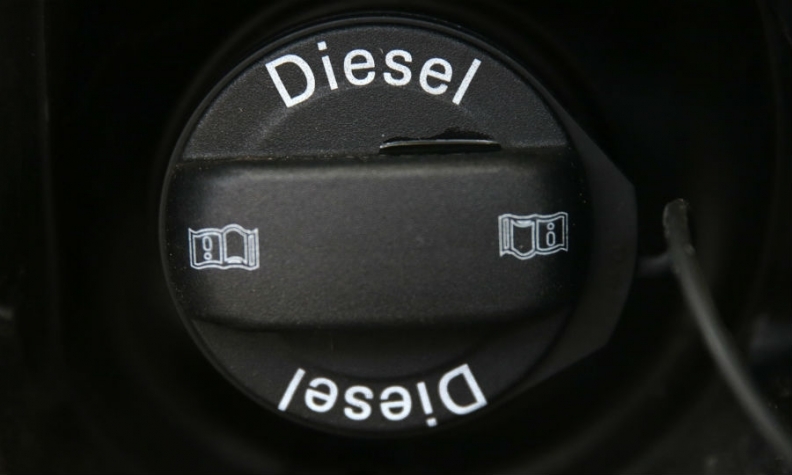 FRANKFURT -- Diesel engines are set to lose their dominance in Europe as Volkswagen Group's emissions cheating raises doubts about the technology's advantages. Demand for diesel cars is likely to plunge to about 30 percent of the region's total auto sales by 2020 from about half currently, hampering automakers' profit growth while speeding up a push to develop battery-powered models, analysts including Jose Asumendi at JPMorgan Chase & Co. said Monday in a report. German carmakers will probably experience an average 5 percent earnings reduction as they promote less profitable hybrid models to meet European Union emissions regulations and as prices drop for used diesel vehicles coming off lease, the analysts said. Luxury carmakers Mercedes-Benz and Audi are already positioning themselves to attract customers with advanced long-range EVs as Mercedes readies its EQ electric subbrand and Audi aims to bring 3 battery-driven models to market by 2020. Diesel cars' popularity in Europe has been waning as Volkswagen's emissions-test manipulation scandal, which emerged in late 2015, compounded concerns that pollutants from the fuel are outweighing the benefits of its lower CO2 emissions. Mercedes outlined plans last week to accelerate a rollout of battery-powered cars by 2022, saying combustion engines would continue to be refined only for a transitional period. "Diesel's share in Europe has been declining for years because of stricter emissions regulation making the technology more expensive," and potential restrictions on the models in cities such as Munich will probably damp sales further, Thomas Schlick, an automotive consultant at Roland Berger, said. "The longer-term implications for a drop in combustion-engine demand are significant for the industry as by our calculations about one-third of jobs in the auto industry are related to drive-train technology," he said. Europe's industry chief, Elzbieta Bienkowska, said she believed diesel engines will disappear in the future after the European Parliament on Tuesday endorsed tougher rules aimed at preventing a rerun of the Volkswagen emissions cheating scandal. "Diesel will not disappear from one day to another," Bienkowska told EU lawmakers on Tuesday. "But after this year of work. I am quite sure they will disappear much faster than we can imagine." Most parts suppliers generate less than 5 percent of revenue purely from diesel systems, JPMorgan's Asumendi said in the report. As the auto industry adopts hybrid and electric powering, investors will probably lose interest in component makers that focus on combustion-engine systems.